Submitted by Jazzman on March 6, 2014 - 8:14pm. Well it is San Diego after all. Most of the cities in the 20 city composite declined in price in both November and December of last year. I believe the same was true for the 25th percentile in Los Angeles. The frothier cities are probably surviving off the sheer momentum of ballooning prices in 2013. Submitted by moneymaker on March 11, 2014 - 10:06pm. 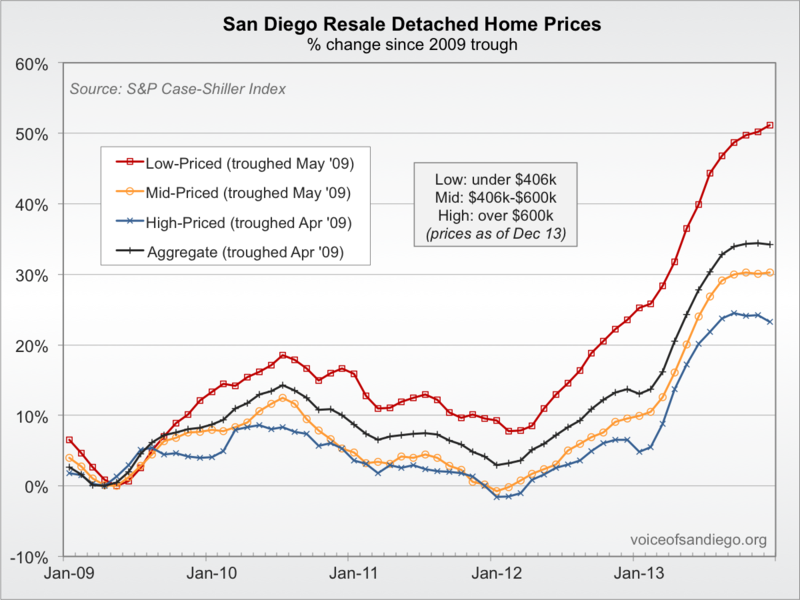 I really like the graphs at voice of san diego. They seem to show that we are bubblicious right now. Seems like the higher price homes take the hit first and the lower price ones recover first, overall though the higher price homes seem to retain value.